Blind patients given a pioneering retinal implant have managed to receive and decipher pictures sent from a video camera. 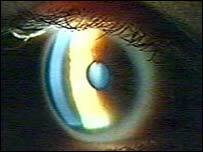 The artificial implant receives visual signals then converts them into an "image" which is transmitted into remaining healthy retinal cells via 16 electrodes. So far patients, in the first trials of the device, have been able to distinguish between everyday objects such as a cup or a plate. However, they have not yet "seen" these objects entirely through their own eyes - the pictures are taken by a video camera then sent to the implant. The results were presented at the meeting of the Association for Research in Vision and Ophthalmology in the US. Only three patients have so far received the implants, which measure four millimetres by five. At first, patients were asked if they could "see" computer generated images sent to the implant. Then an external video camera took pictures, then transmitted them to a receiver, which is also implanted, this time behind the patient's ear. Professor Mark Humayun, from the Keck School of Medicine at the University of Southern California in Los Angeles, said: "We have found that the devices are indeed electrically conducting, and can be used by the patients to detect light or even distinguish between objects such as a cup or a plate in 'forced-choice' tests conducted with one patient so far. "We plan in the near future to look at how useful the prosthesis can be in activities of daily living." Although the implants in use so far have only a limited number of electrodes - meaning objects can be seen only in very low resolution, future models are hoped to have many more electrodes, improving the "vision" of patients. The device is aimed at patients who are blind because of a degenerative eye disease such as retinitis pigmentosa or macular degeneration. In these illnesses, while light-receiving cells at the back of the eye have died, the next layer of retinal cells, which begin the process of sending signals back to the brain, are intact. The electrodes simply "plug into" those cells, allowing images to be sent directly to the brain.